In the beautiful Norwegian fjords, a catastrophic rockslide-induced tsunami, 80 meters high, will inevitably strike the community of Geiranger one day. Geologist Kristian (Joner) and his likeable family are due to leave, but his final day at an early warning centre alerts him to worrying developments. If his fears prove correct, inhabitants will have only 10 minutes to reach safety…. 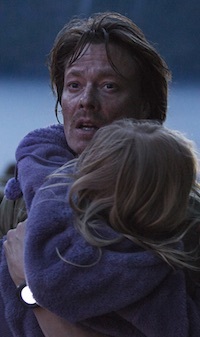 The authentic scenario and locations help make The Wave an exceptionally tense and thrilling experience, and director Uthaug ensures that you care about characters with “unusual depth for a genre film” (Hollywood Reporter). This Review, here is from Variety. while an english sub-titled Trailer can be seen below…..
Linguistic pedants may spot the ‘English is not my first language’ typo in both review and trailer links….